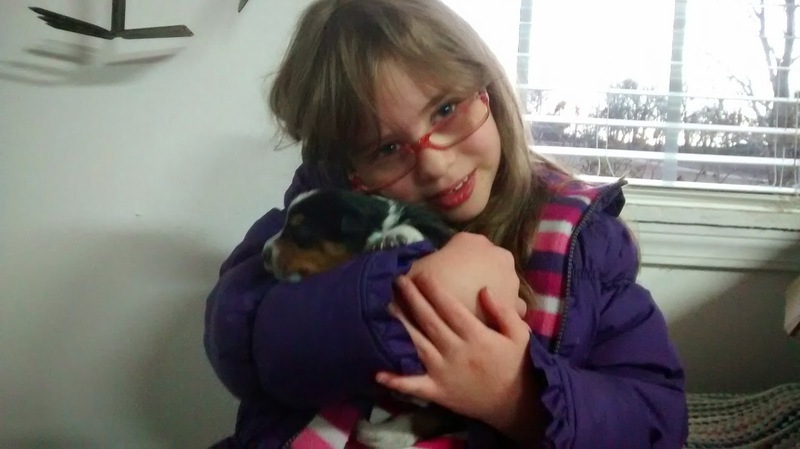 Google The Unplanned Homeschooler: Another unplanned learning adventure - PUPPIES! Seven beautiful puppies arrived in the world the day after Christmas, and my mom, my older daughter and I were there to witness the birth. 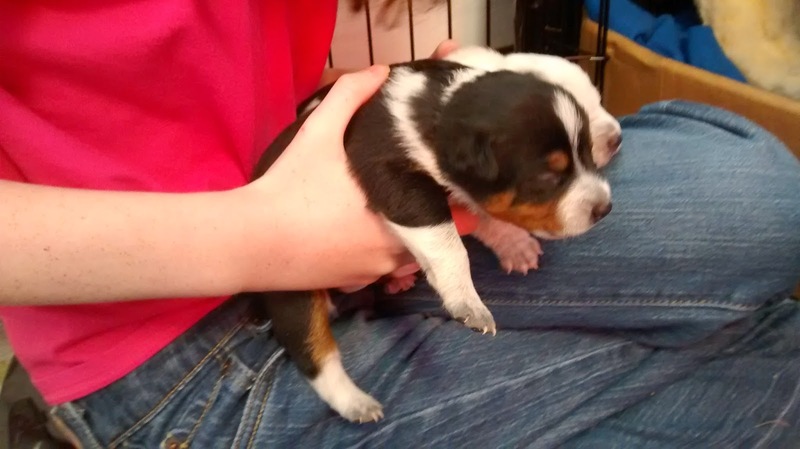 It was the first time my daughter and I had ever seen puppies born, and it was really amazing. 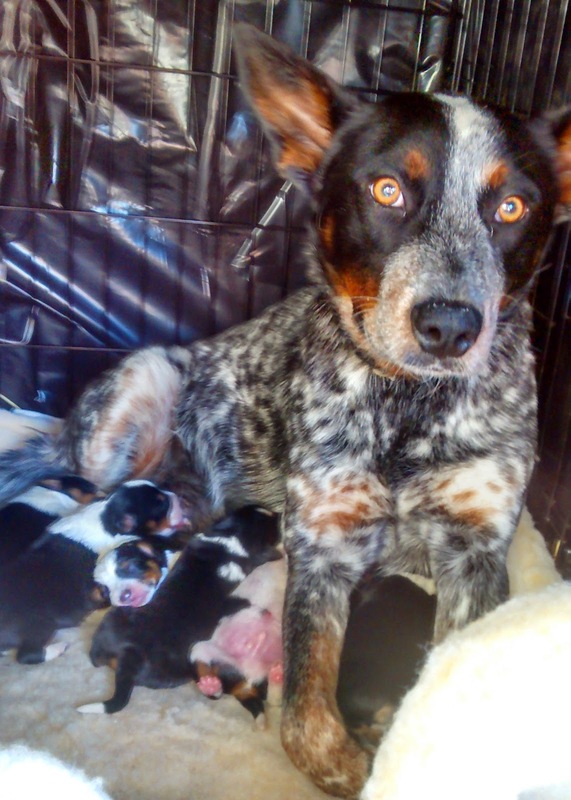 It was clearly Blue's first litter, and she seemed scared and a bit confused while birthing the first pup, but she was a natural. We didn't have to assist her in any way. 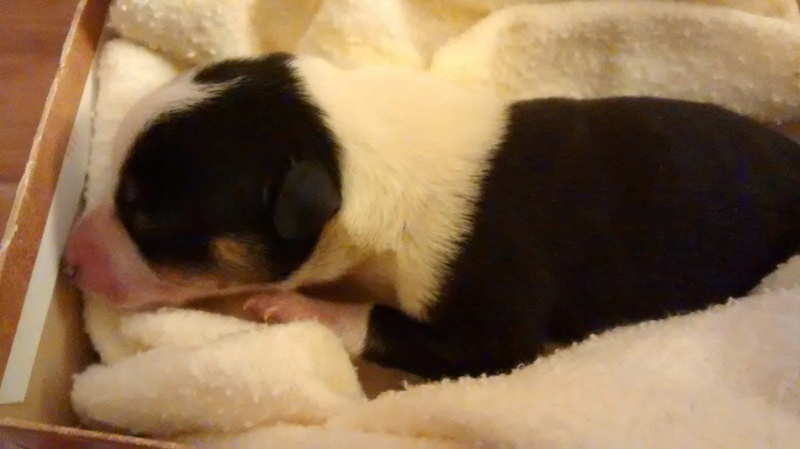 Sadly, the smallest of the litter was born with a cleft palate, a relatively common birth defect that almost always means death because the puppy can't form suction and must be carefully tube fed, and even then is likely to develop pneumonia. Veterinarians recommend euthanasia for these unfortunate pups. We did our best to keep the little guy comfortable, but he didn't last long. 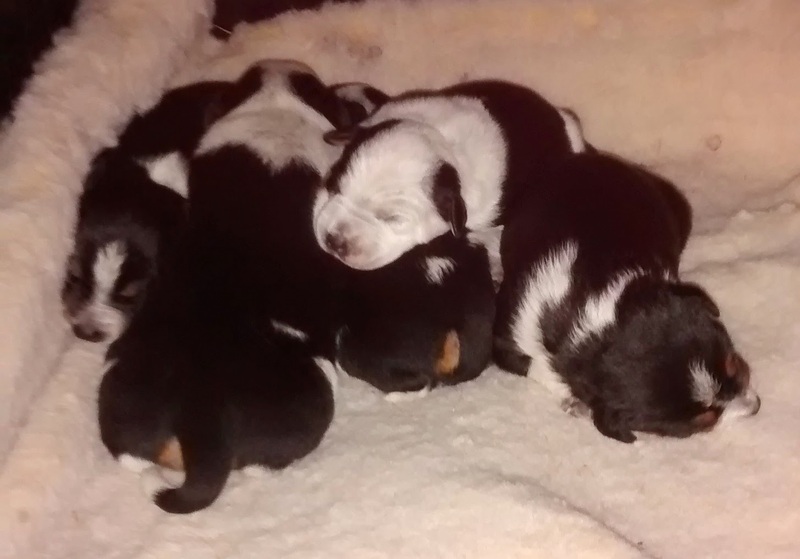 The other six puppies thrived. 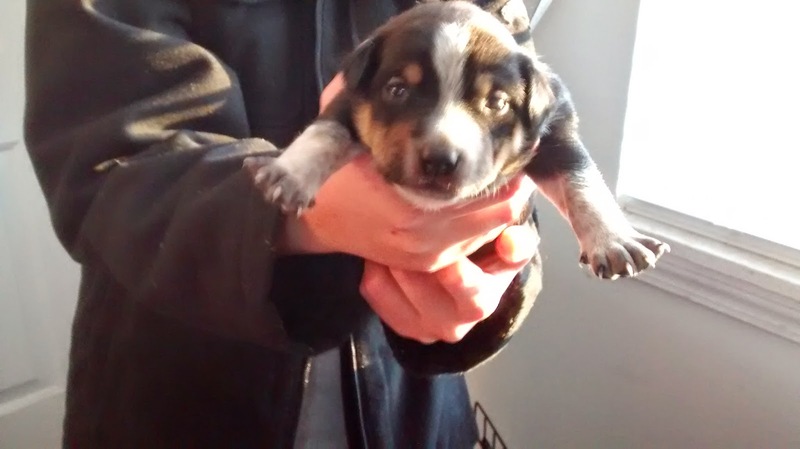 Four boys and two girls, all with beautiful markings that clearly resembled their mother, and suggested they might also be part border collie or Australian shepherd. Blue, in the meantime, became less and less timid around the people she now considers family, and began to exhibit how intelligent she is, playing gently with the children and standing guard against strangers and deer. If she'd been our dog from the beginning, there wouldn't have been any Christmas puppies, because she would have been spayed as soon as she was old enough. But coming into our lives this way, all we can do is try our best to make sure the pups find great homes and get as much out of this one-time experience as we can while it lasts. 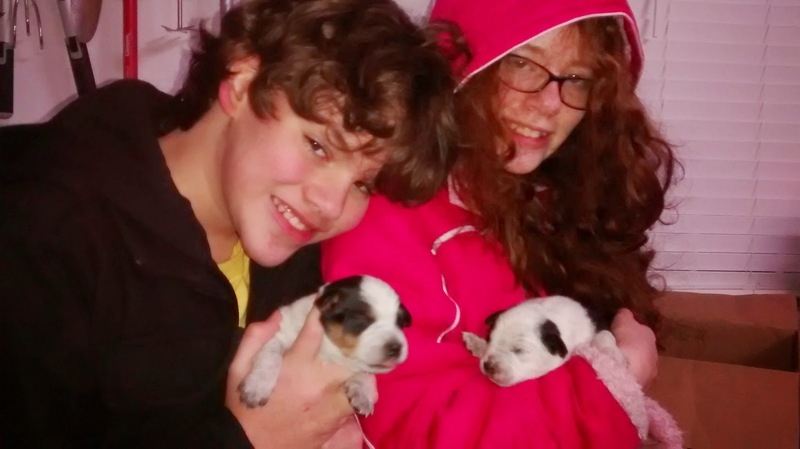 At two weeks old, the puppies have been loved on every day, and handled gently by children who adore them. My kids have learned all about puppies. Although this, like many of our homeschooling adventures was completely unplanned, it's been an amazing experience, and one that's going by far too quickly. or one of these. It's so hard to decide!